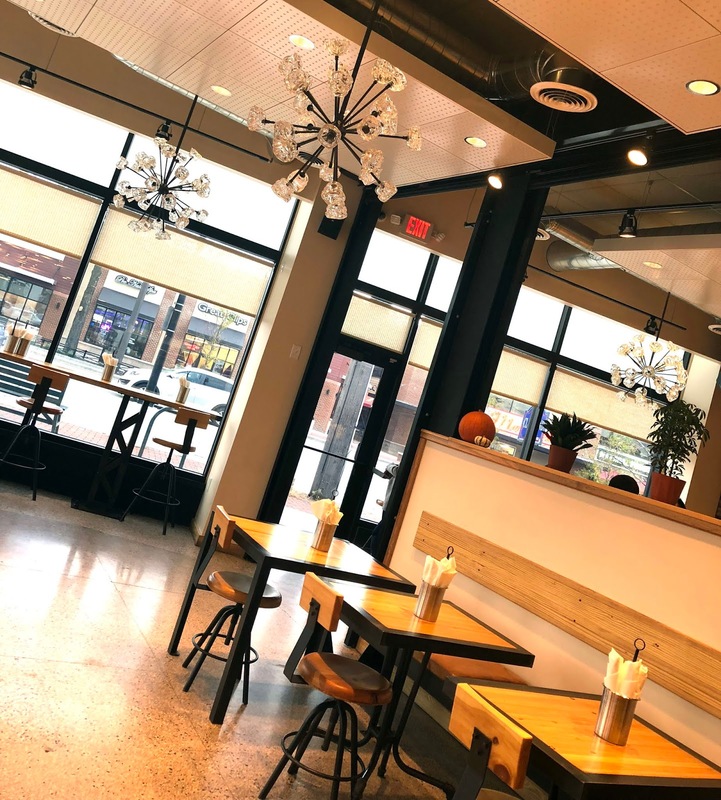 Ohio City Galley opened its doors last Friday. 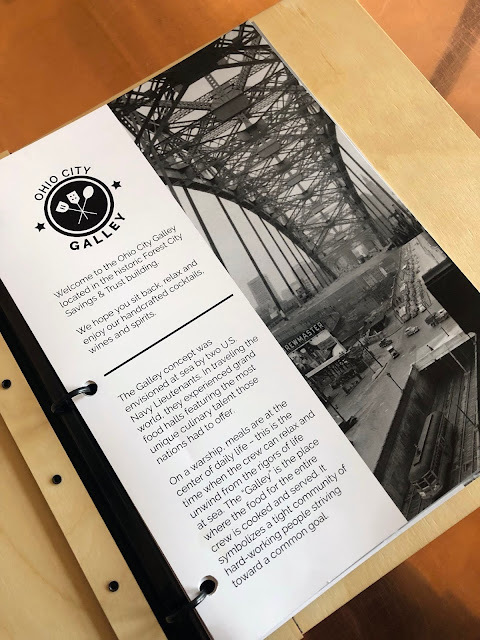 Ohio City Galley, the third food hall and restaurant accelerator from Galley Group, is a launch pad for exciting new restaurant concepts in Cleveland. The mission is to cultivate and accelerate aspiring restaurateurs by providing a forum to showcase their capabilities, hone their craft, develop business practices, and build a following behind their concepts. No more negotiating and choosing what type of food you and your spouse, friend, or family feel like eating that night! There's something for everyone between the four restaurants housed there, and I can already tell it will become a good backup for Mr. H and I when we can't agree. 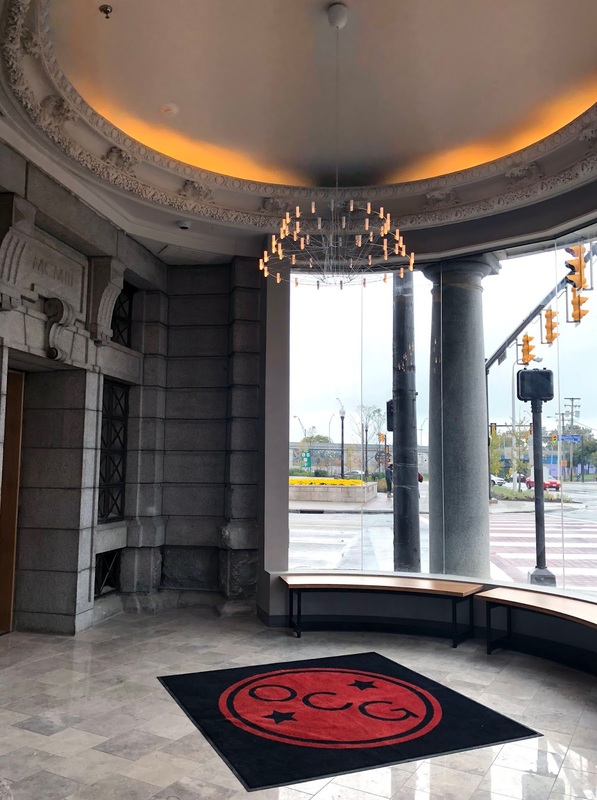 It's housed in the renovated Forest City Bank building on the corner of West 25th Street and Detroit Avenue, which makes for a very pretty backdrop. 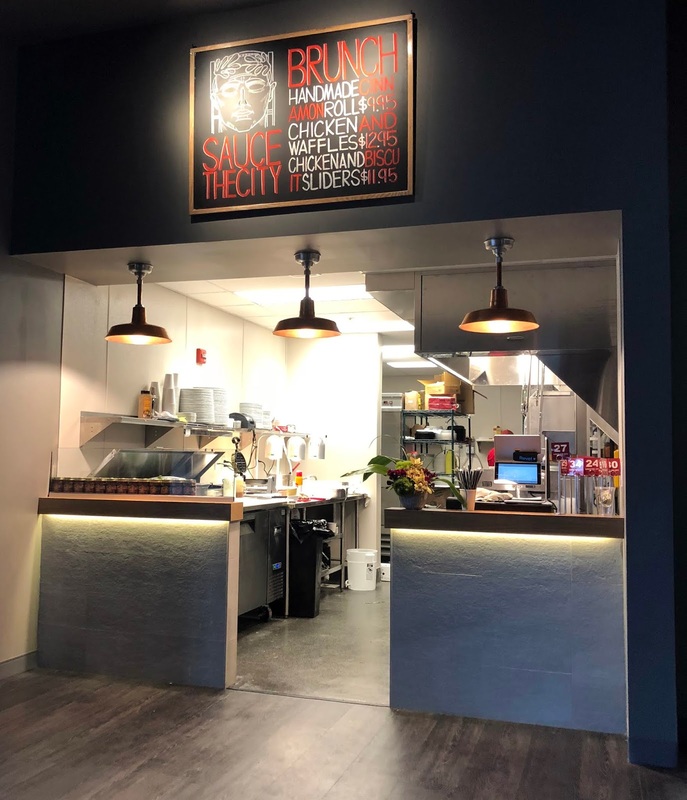 With four fully outfitted kitchens, diners get to place orders at any of the four counters: The Rice Shop, Tinman, Sauce the City, and POCA. 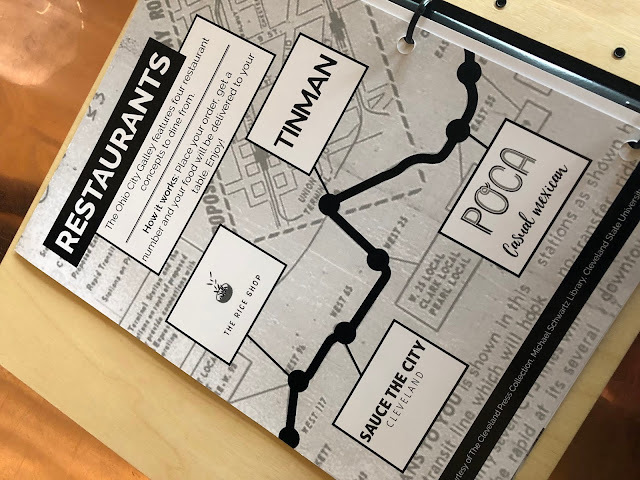 I've already written about POCA, since it's the same chef/owner as our current favorite Cleveland restaurant, The Black Pig. 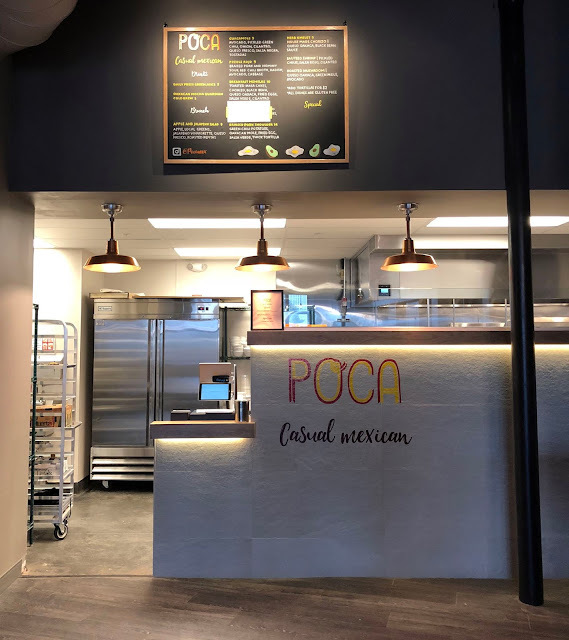 We attended a preview pop-up event several weeks ago, and the casual Mexican food is unlike any other I've had in the city. But, I was also excited to start trying food from the other three as well. 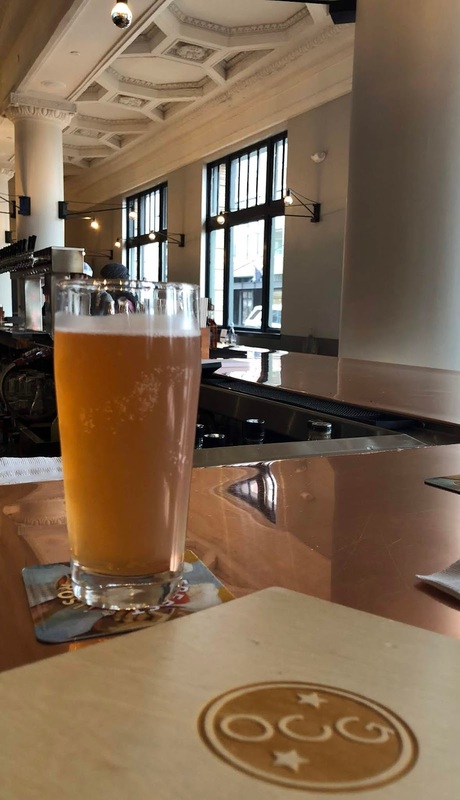 With over 200 seats and a giant communal bar serving craft beer, cocktails and wine, you take a seat with your numbered/color-coded cards and servers bring out your food from each restaurant as it's ready. 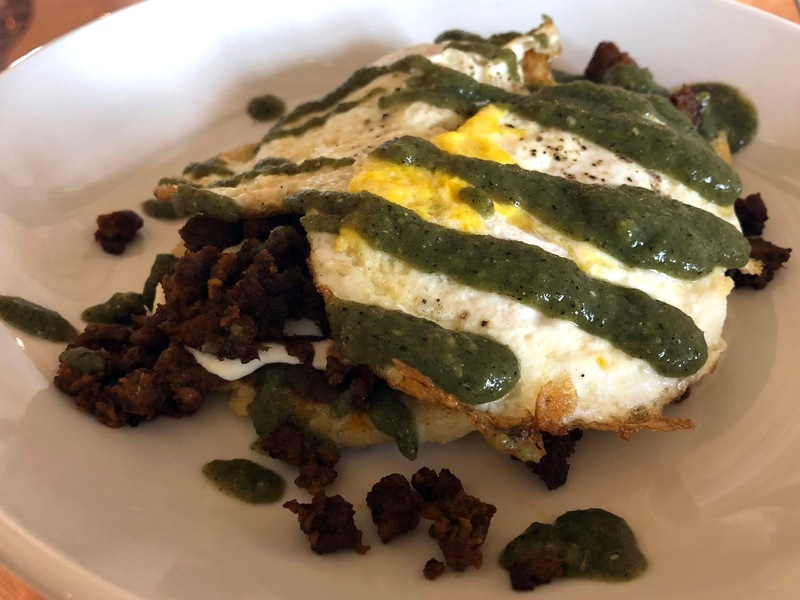 It was Saturday Brunch, so we tried the Breakfast Memelas ($10) from POCA with chorizo, toasted masa cakes, black beans, queso oaxaca, over-easy eggs, salsa verde, and cilantro. Great flavors and textures, I'd get this again! 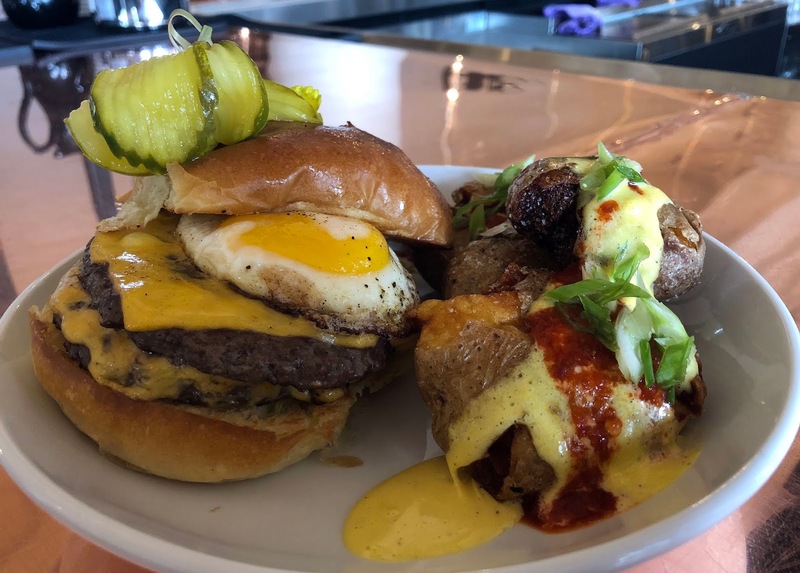 I'd also started to hear that the burger from Tinman was already becoming a "don't miss" item, so we shared the A.M. Burger ($16) with sunny-up egg, American cheese, S&S pickles, and special sauce. The burger impressed, and was probably one of the best we've had in quite a while. The side of smashed potatoes was also very good (spicy, so beware if that's not your thing). The space could use some warming up and additional character, in my opinion. But it's been renovated well, and the food and service were almost flawless, even for opening weekend. We'll continue to eat our way through the current four restaurants, and look forward to what the future brings in this space. This was one of those weekends that I was soooo ready for. 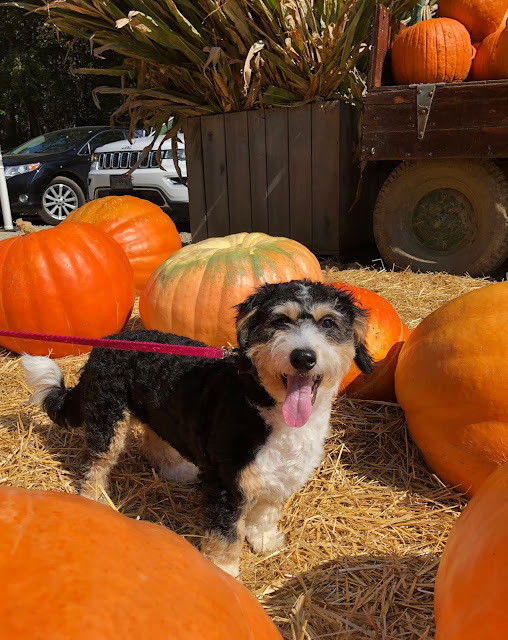 Our puppy was sick last week, so I had worked from home the last couple of days. By Friday, I was ITCHING to get out of the house. Well, we more than made up for it. We had some fun food adventures that I'll be sharing with you later this week, but for now I'll share the other weekend highlights. 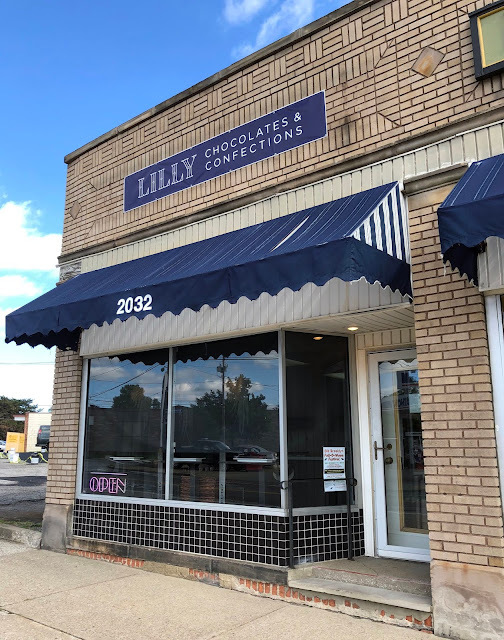 Saturday brought the Grand Opening of the new Lilly Chocolates and Confections location in Old Brooklyn, so we swung through for some sweet treats. But it also gave us a perfect opportunity to check out their new neighbor as well, the 2020 Schaaf Gallery + Studio. Featuring Cleveland-themed original and print artwork, as well as all kinds of crafting and art workshops and events. 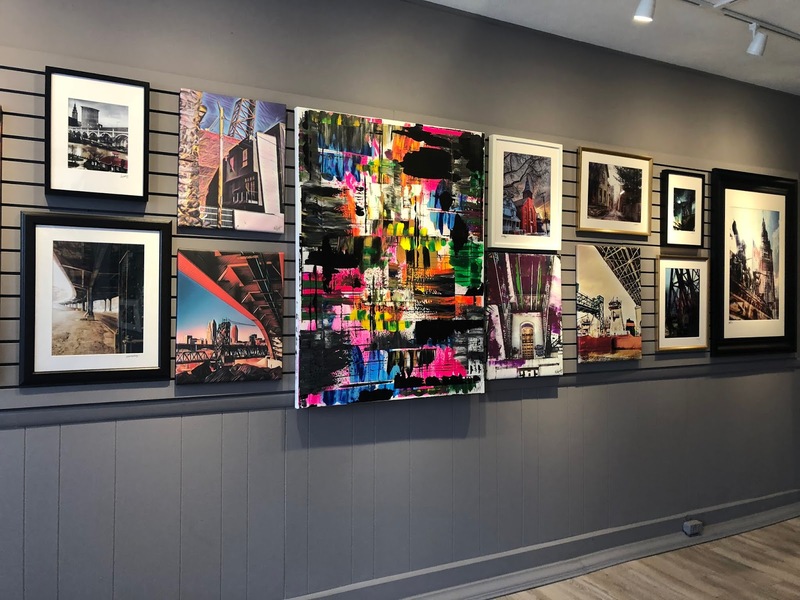 It's an adorable and warm space, with artistic activities for all ages being offered and artwork at very reasonable prices. Check them out! What would any good weekend be without a stop at Old Brooklyn Cheese Co.? In addition to picking up a couple of delicious cheeses, I also learned an important piece of holiday news. 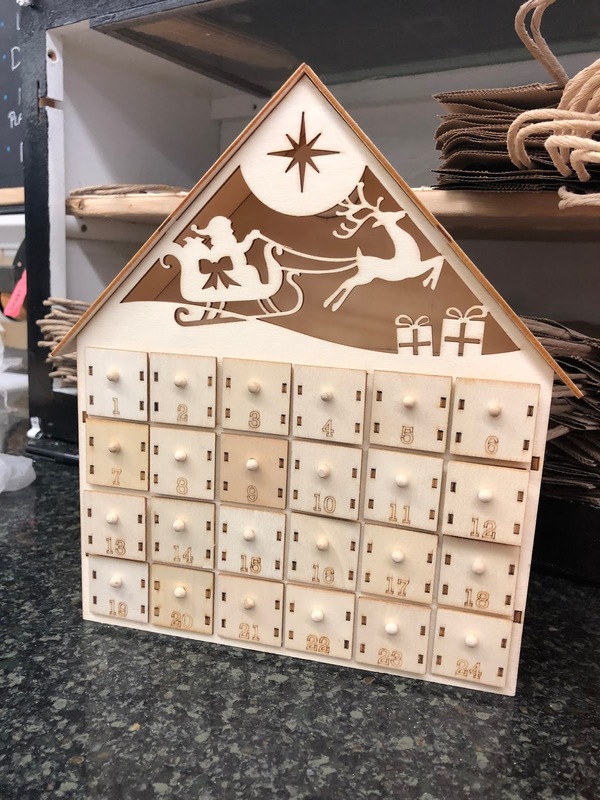 They will be offering a CHEESE ADVENT CALENDAR, available to order next month. You may have heard the buzz about this year's new Cheese Advent Calendar offered by Target. Screw that! 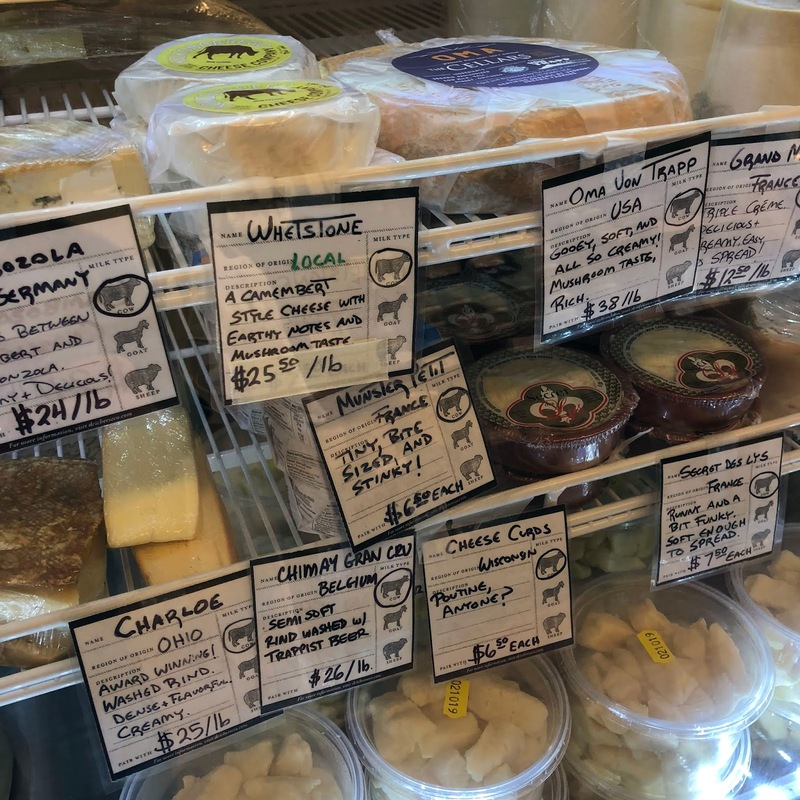 Get me the local and gourmet version from Old Brooklyn Cheese Co. Just take my money now. All of it. I'm in holiday cheese heaven with this news. Saturday night, we headed out of our comfort zone and scooted out to Willoughby. Mainly so that I could finally get my hands on the Nut Smasher at Willoughby Brewing Company. It lived up to the beer hype. After a fun (and boozey) Saturday night out, we needed a Sunday cure. So we headed to Touch Supper Club for brunch. We hadn't been since they reopened after a long process of renovations quite a while ago. I didn't see much change inside, and the menu was almost identical, but it was like saying hello to a long-lost friend. 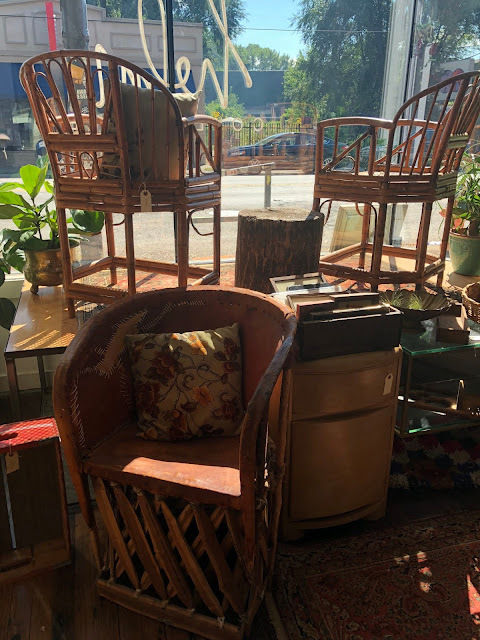 After brunch, we headed down Lorain for some vintage shopping. Please, please someone go buy this adorable brass Chinese dumpling cart (pictured below) from Helm Collective! What a conversation piece. 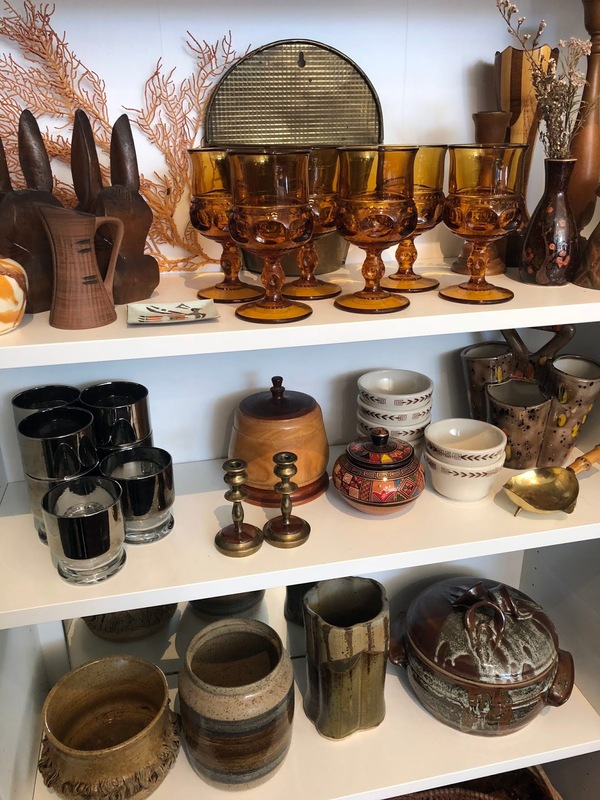 And you could style it in so many ways, plant stand, bar cart...I wish I had room for it. As the rain kicked in, we headed home and curled up for the evening. Being so busy made the weekend fly by, but it was exactly what I needed after being cooped up. Thanks for a great weekend, Cleveland. I love you. Landmark is a smokehouse, deli, and bar focused on providing fresh food with high-quality ingredients quickly in a modern and relaxed environment, housed in the former Clifton Diner space (next to Twist Social Club and owned by the same folks--- the garage-style doors and windows even open up to expand the Twist space into Landmark). They source local and all natural products whenever possible. In addition to the house-smoked meats, they have a variety of vegetarian and vegan options as well. The soul of their food is the 100% wood-burning J&R Oyler 700 smoker. I got to try some of these meats the other night, thanks to Mouthwater Media. Reuben ($15) with your choice of Montreal smoked meat or smoked turkey, Swiss, Cleveland Kraut, Russian dressing and grilled rye. Ribs (currently a Thursday special, but making more frequent appearances due to their popularity). You can try a little of everything with the 1 lb. Smoked Meat Tray ($25) with brisket, pork, turkey, coleslaw, pickled onions, mustard, pickles, toast points, and choice of two BBQ sauces on the side. But, it's not all about the meats. Like this Fried Goat Cheese ($12) salad with radicchio, endive, candied walnuts, dried cranberries, and Dijon dressing. House Chopped ($10) salad with smoked turkey, bacon, romaine, arugula, avocado, tomato, croutons, and blue cheese dressing. You can get plain mac and cheese or add on meats, like the BBQ Pork Mac and Cheese ($17) version with shell pasta, smoked Gouda, cheddar, chives, and panko bread crumbs. Not pictures, we also got to try their rice bowls. Our favorite was the Thai Peanut ($13) with grilled chicken, jasmine rice, broccoli, carrot, roasted red pepper, grilled pineapple, and Thai peanut sauce. Save room for dessert! You can get Crème Brûlée ($5). Or a Chocolate Chip Cookie ($2), served warm. They also serve alcohol, so grab a craft beer, wine, or cocktail at the counter as well and settle in for a casual, but really tasty, meal. Open daily from 7AM - 10PM on the corner of West 117th and Clifton Boulevard. Right across the street from the new Lucky's Market. We are often trying to think of where to grab a quick and casual meal in that neighborhood, and this spot just rocketed to the top of the list. Disclosure: I was provided with complimentary food and drink in exchange for social posts. All opinions stated are 100% my own. If this weekend was any indication, Cleveland has moved into full-blown Fall. And I'm loving every minute of it. Besides the preferred clothing options, fun fall activities, and fires in the fireplace...it also means fall comfort foods. Chef Natasha Pogrebinsky at The South Side in Tremont has fully embraced some of these classic flavors and hearty dishes on the new Fall Menu. Like her take on the Clam Bake! And Sweet Potato and Sage Pierogi ($15) that are pan-fried in brown butter with fresh sage, topped with Parmesan cheese, and served with a side of dill-infused sour crème. The Clevelander ($18) with Mediterranean jumbo butter beans stewed with tomatoes, kale, fresh local kielbasa and sausage, poached egg, and served with dark toasted ciabatta just looks as "Cleveland" as it sounds. A fun twist on a classic side of tater tots are Our World Tots ($12) with crispy fried mini potato cakes, stacked with bacon, cheese sauce, jalapeno, cilantro, blue cheese, cheddar and hot sauce. Lastly, my favorite dish, the Pasta of the Day. This time of year, bring on the pasta! This particular one was with fresh ricotta, a gorgeous egg yolk, crispy breadcrumbs, and spinach. I admit, this restaurant had fallen off my radar the last several years. With Chef Natasha at the helm now, the menu already sounds more appealing to me, and overall the dishes impressed. The only ones I didn't care for were the BLT Tacos, Tuna Stuffed Roasted Tomato, and Garlic Rose Flatbread. But other highlights included the Mushroom Arugula Flatbread and Mini Chicken Tacos (these you could eat a whole bag of, like chips! So addicting.). Disclosure: I was invited to a media and social influencer tasting where all food and sangria was complimentary. All opinions stated are 100% my own. A re-branding and relocation from Tremont to Old Brooklyn, Lilly Chocolates and Confections has opened its doors on Schaaf Road. 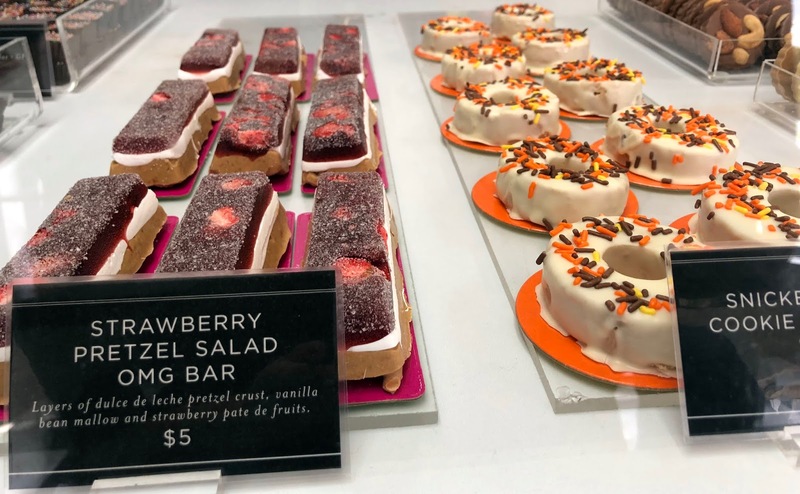 ...but then a big expansion of their additional dessert offerings daily. 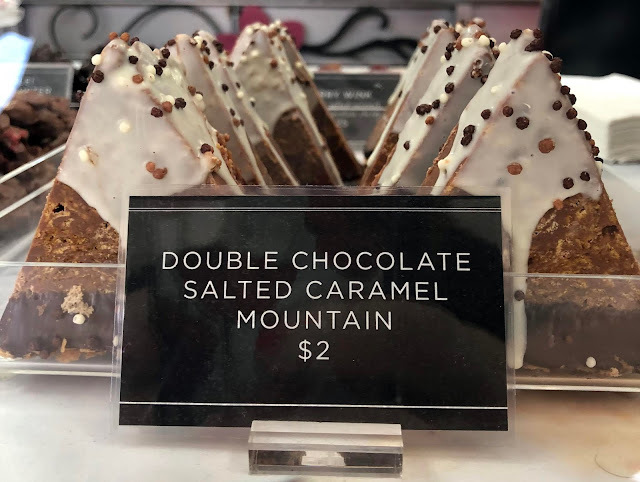 Mr. H's favorite was the Double Chocolate Salted Caramel Mountain. While I was obsessed with the Snickerdoodle Cookie Donut. The snickerdoodle cookies sandwiched inside were soooooo soft. We shopped there often enough when it was located in Tremont. But now that it is walking distance from our house...I'm equal parts thrilled and terrified. Their desserts are just so damn good, and they have the cutest packaging. 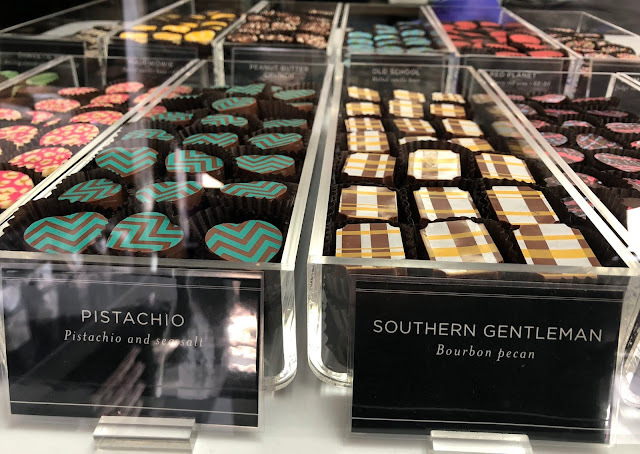 They make a great hostess gift, birthday present, corporate appreciation token, or a thoughtful "I love you." for just about anyone. Check out the new shop, you'll love it even more than the original. Thanks to Mouthwater Media recently, I got to head back to Saucy Brew Works for a visit, but tried their food this time too. Of course, they are already known for their Pizza. We got to sample five versions, with my favorite being the Bees Knees (Small- $13, Medium- $17, Large- $24) with red sauce, honey, spicy capicola, mozzarella, and red pepper flakes (pictured bottom left). Thin crusts, loaded with toppings, and gluten-free crust, vegan cheese, or build-your-own pizza all available by request. While this won't win my heart for favorite pizza in town (STILL LOOKING! ), they have a good selection of specialty pizzas and it's solid brewery food. But then we got into the non-pizza items, and those surprised me at how good everything was. The Mac & Cheese was loaded with like 5 different cheeses, including cream cheese which made it extra creamy with a hint of tang to it. The Saucy Balls ($13) with beef and pork, pecorino romano cheese, and tomato sauce. But, the star of the evening for me was the Roasted Onion Dip ($8, $4 during Happy Hour) with mozzarella, provolone, caramelized onions, roasted red onions, parmesan, and crostini. Not only was it delicious and reminded me of French Onion Soup (which I love), but I took some of the leftover dip home and made the most heavenly grilled cheese with it the next day. I need that again in my life! Like seriously, they should add that as a menu item. It was a fun evening hanging out with fellow foodie bloggers, but I was also happy to try more of Saucy Brew Works. 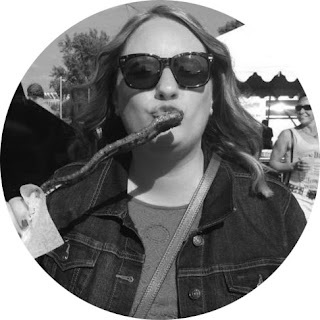 I was loving their passion for the food and beer, and mission of getting more cheese into people's mouths. Cheese is the way to my heart. Disclosure: I was invited to attend a blogger tasting and all food and one drink ticket was provided. All opinions stated are 100% my own.